teaching – Can I Get a Pencil? This summer, I listened to an episode from the Cult of Pedagogy podcast in which the host, Jennifer Gonzalez, interviewed veteran teacher Liz Galarza on how she uses dialogue journals in her classroom to build teacher-student relationships. Essentially, Galarza explained how she keeps a running dialogue with each of her students in the form of letters. She writes a letter to each student at the beginning of the year, and they respond to her with their own letter. Then she responds to that letter, and then they respond, and so on and so on. If a student misspelled a word, Galarza would intentionally use that same word, spelled correctly, in her response; if a student struggled with using commas to separate ideas, Galarza would write a sentence in her letter that modeled that sentence structure. Finally, she said that she always thanked each student for their letter at the end of her responses. As I am always looking for ways to build and strengthen relationships with my students, I immediately gravitated towards this idea of using dialogue journals in my 6th grade English Language Arts classroom this year. Galarza and her students handwrite their dialogue journals, but since my school is 1 to 1 with technology and my handwriting becomes increasingly illegible the more I write over an extended period of time, I decided to house our dialogue journals in a running Google document that I created for each kid. First, I am learning WAY more about my students’ interests and personalities than I have in my previous six years of teaching. One of my students practices magic in his free time. Another’s favorite movie is “Nacho Libre”. A girl I teach has more than seven pets, including a three-legged turtle. One boy just recently moved to the school at the end of last year, and he still misses all of his friends and family back east. Another girl has expressed to me how tired she is of living in a small town, and that she cannot wait to move to a big city when she gets older. Every school year, teachers across the country start the first week with some sort of “getting to know you” activity in which they ask the students to tell them a little about themselves, usually in the form of a letter or poster. The problem with this, however, is that’s really one of the only times that this type of experience occurs, which leaves teachers and students to build relationships through verbal interactions alone. For many students, that is not enough. I’ve had plenty of classes where I may say just a few words to some of my students, especially the ones that tend to be more reserved. These dialogue journals are creating windows for both my students and I to peer into each week, and they’ve taken that token first week of school activity and turned it into a living and breathing thing that is ongoing. In addition to the relationship-building benefits, I’m seeing significant growth in both my students’ grammar and writing stamina. Last week, I pointed out to numerous students how much their writing had improved from their first letter to me to the most recent. I’ve had multiple students go from not using a single period in their initial letter to me to being able to write a letter to me that doesn’t contain one run-on sentence. It’s remarkable, and I know it’s the result of the modeling that I am doing for them in my letters to them, which is such a more engaging way to work on grammar as opposed to a mini lesson on run-on sentences. My students are also writing more in their letters to me each week (for the most part). Like anything, writing improves with practice, and these journals provide students with low-pressure opportunities to work on their writing craft. By writing more on a regular basis with an authentic audience (me), they are becoming more comfortable at expressing themselves through written word. Another benefit of the dialogue journals is that most of my students truly enjoy this activity. I set aside the first 15 to 20 minutes of class every Monday for dialogue journals, and students rush to get onto their docs so that they can read my latest letter to them and respond. Even though this has become an entrenched routine in our classroom, I still have students stopping me in the hall on Mondays to confirm that we are in fact doing our dialogue journals. However, there are definitely a handful of students that need some additional prompting. In my responses to my students, I try to ask two to three questions about things that they mentioned in their last letter to me so that they have somewhere to start when they write to me next. I also add a fun question at the end of each letter like “What was the last show you watched on Netflix and why?” or “If you could be any animal, which would you be and why?” in an attempt to stimulate conversation. Some students, though, either don’t have a lot to say, or they just aren’t that into writing out their responses, and I don’t get much in return from them. With these kids, I continue to push them to write more by asking them follow-up questions that require them to explain their hobbies or trips to me in more detail, and I implore them to ask me questions as well as a way to promote conversation. Hopefully, we will have a breakthrough at some point this school year. I should mention, too, that this activity does require some additional time and effort on my part. In general, it takes me roughly 45 minutes to an hour to respond to dialogue journals for one class of twenty-something students. Fortunately, I’m teaching in blocks this year in which I have the same group for both ELA and Social Studies, so I have far less students than I have in the past, which makes this less of a burden. However, I know that many ELA teachers have anywhere from 90 to 150 students on their rosters, and writing weekly responses to each and everyone of them is simply not feasible. If I had more students overall, like I did at my previous school, I’d probably have the students write in their dialogue journals on a bi-weekly basis. Regardless of how many students I have on my rosters in the future, I will certainly still incorporate this activity into my classes because I’m finding it to be invaluable for both the relationship-building and writing benefits that my students are seeing. In less than a month, I will complete my sixth year of teaching. The first two of those years were in a 10th grade World Literature classroom, and the last four I have been teaching 7th grade English Language Arts. When I told my high school colleagues that I would be moving down to middle school, the most common reaction usually involved the phrase “You’re crazy!” Over the past four years, whenever I tell someone that I teach 7th grade, I’m either told that I’m “brave”, or that they couldn’t imagine being around that many 13-year-olds all day. “I hate your class!” If you teach in a middle school, then you have invariably heard this phrase either muttered under a student’s breath; or, it’s been hurled right at you with reckless abandon. As both a teacher and a human, one’s first response is to take offense to such an aggressive statement and jump on the defensive. Let me give you some advice: don’t. Any kid that has worked up enough moxie to shout out such a brash criticism is clearly dealing with something outside of the class or school that is impacting their emotional stability. They don’t hate your class; they hate whatever is disrupting their lives at the moment and they don’t know how to confront it, so the easiest way to vent is to target a scapegoat, i.e., your class. Whenever a student has offered me this review, I typically respond with a quick and semi-genuine “Thank you”, which I have found usually diffuses the situation (diffusing situations is a major part of being a middle school teacher). “This class is boring.” If a kid says this to you, then take it as a badge of honor; I know I do. Any student who tells you that your class is boring is not actually referring to the lessons and content of the class; what they really mean is that in your class they don’t get to talk off topic and joke around with their friends any time they please. Also, they’re not allowed to leave their seat whenever the moment strikes them. “This class is boring” is code for “You have solid classroom management skills”, and you will usually only hear it from students that historically are more likely to push the boundaries of the classroom expectations. I have students that are completely wrapped up in the independent reading books that they are reading in my class, so much so that they will take them into the halls with them when we take restroom breaks, and yes, these same students have told me that my class is boring. Once again, don’t take anything a middle schooler says personally. They need to move some during class. My favorite professional learning sessions are always the ones that tend to be more interactive. I’m not nearly as engaged in an hour long session in which I’m in my seat for the entire 60 minutes, and our students aren’t either. Middle school students are like overgrown elementary kids with bodies that are growing and surging with hormones. The boys literally cannot be still for extended periods of time. Plan for 5 to 8 minutes of class time that will allow the kids to be free of their chairs so that they can stretch out and move about. I’ve been known to hold “Rocks, Paper, Scissors” tournaments after our independent reading time as a way to get the kids’ blood pumping again before we move on to our next activity. These tournaments last for 2 to 3 minutes, and they serve as excellent brain breaks for these kids. Another strategy I’ve used a lot this year to get my students out of their chairs is at the end of the class, I have everyone stand up with their composition notebooks. I then play a song on the overhead, and they can walk, dance or slink about the room. When the music stops, they share one of their responses to something that they read during our work session. When the music starts again, they move, and when it stops, they share again. My kids absolutely love closing out class this way, and some of my toughest kids will be dancing their hearts out to Justin Beiber between sharing sessions. Don’t take anything they say personally. Remember earlier in this post when I encouraged you not to take things personally? Yeah, that’s kind of a biggie if you want to survive in a middle school atmosphere. You see, these students’ brains are not fully formed, so they do not yet have the development that allows them to control some their impulses. The result: they can say some rather rude things to each other and to you. I just try to reteach and dialogue with them when they same something offensive. I’ve had huge success from just asking them to put themselves in my shoes and consider how I felt about whatever they said. It’s amazing how giving them a little perspective can help them understand the power of their words and actions. If you’re having a tough day or you don’t have time to explain to a middle schooler why they shouldn’t say how amazed they are by how old YOU ARE, just give them a quick “Thank you” and move on. Use a lot of self-deprecating humor. Middle school students are the fragilest of fragile. They have zero tolerance for commentary on their appearance or intelligence. This is why they can be so quick to make fun of others at this age. But you know what will really get them eating out of the palm of your hands? Make fun of yourself! I do it all the time. I routinely act like I’ve never heard of wildly popular rap songs in front of my kids, even though I probably listened to said song 10 minutes earlier on the drive into work. They love it! There’s something about being lame while not knowing you’re lame that they find hilarious. Last year, I pretended in front of a class that I thought when they said something was “lit” that they were commenting on the lighting in the room. The laughter from my class could be heard from across the hall. However, my relationships with those kids grew tremendously because they would take any free moment to try to teach me things that they felt I must know regarding slang and pop culture. I became sort of a project for them, and they entered my class with a positive attitude and ready to learn. Fellow middle school teachers – what are some things that you know for sure about middle schoolers? A culture of choice independent reading is ingrained into my classroom, from the extensive library of books on my shelves to the daily book talks that my students and I give to one another. Students in my class get the first 10 minutes of every class to read from a book of their own choosing, and long story short, they read A TON more over the course of the year than their peers in neighboring classrooms. I work in a Title I public school in which nearly 90% of the student population is either African-American or Latino, so my classroom library primarily contains books with authors and characters that look like my students. My kids deserve to see themselves in the texts that they read. My first period reading support class is currently reading All-American Boys by Jason Reynolds, a book that deals with the social injustices that exist for African-Americans in their interactions with law enforcement. My Language Arts classes are currently reading Monster by Walter Dean Myers, a novel that examines the prejudices that remain in the justice system and how that system works against people of color. I supplement these books with informational articles about relevant issues and people: Michael Brown, Philando Castile, Tamir Rice, Eric Gardner, Stefon Clark, etc. I have various students that are reading or have read The Hate U Give, Dear Martin, and I Am Alfonso Jones. I’ve read these books as well and held small group discussions with my students that have enjoyed them, too. 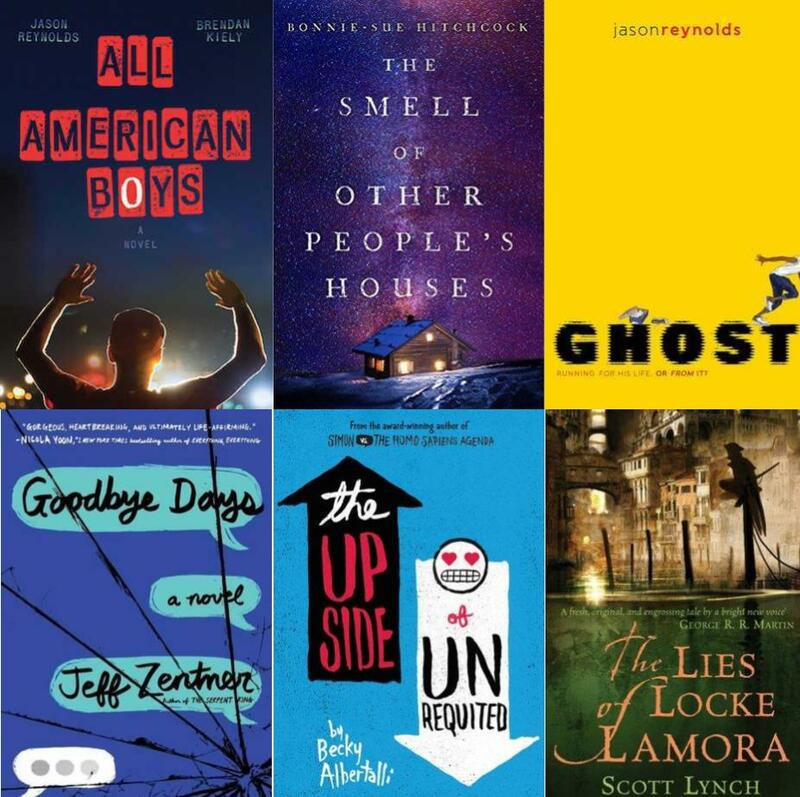 These books deal with uncomfortable topics like white privilege and police brutality. We talk about these things. I acknowledge to my students that I understand the number of benefits I enjoy in this country simply because I am a white man. We lament how unfair that is and we talk about ways that we can make meaningful changes in regards to these shortcomings in our society. My girlfriend teaches History at the elite private school in our town, and recently she learned that the 9th graders at her school were reading both The Hate U Give and Dear Martin. Over 80% of her school is comprised of affluent white students, and that’s exactly who needs to be reading THESE books. When my students read those aforementioned texts, they get angry and frustrated, probably because many of the issues in the books are realities for them and their families. However, for these private school students, reading a book from the perspective of an African-American female teenager (The Hate U Give) is most likely a point of view that they have never considered. Trying to understand what it’s like to be discriminated against for no reason other than the color of a person’s skin (Dear Martin) is a situation that your average white private schooler has not encountered before. The fact that the students at my girlfriend’s school are reading these books is uplifting. It gives me hope for the future. It makes me want to get these types of books in the hands of white high school students across the country as quickly as possible so that they can see and feel what it’s like to be a marginalized person in this country. If we want to continuing progressing on Dr. King’s arc of the moral universe towards justice, then we must have discussions about social injustices in every school, and not just in the ones in which the students doing the talking are also members of the oppressed group.